Smart, loyal and lively, the Chinese Li Hua is gentle with people but has a reputation as a talented hunter of rats and other vermin. See all Chinese Li Hua characteristics below! The unofficial cat of China, the Li Hua (pronounced “lee-wah”) is thought to be one of the earliest known domestic cats. Based on their mention in old books, they have probably existed throughout China for centuries, but it is only recently that they have been developed as a breed. This is a natural breed, meaning it was not developed through crosses of other breeds. The Chinese Li Hua was accepted into the Cat Fanciers Association’s Miscellaneous Class in February 2010. The Chinese Li Hua cat is also known as China Li Hua, Dragon Li, Li Hua, Lu Hua Mao, Li Hua Mau, and Li Mao. The Li Hua typically weighs between 9 and 12 pounds. Smart, loyal and lively, the Li Hua is gentle with people but has a reputation as a talented hunter of rats and other vermin. His retrieval skills extend beyond rodents. One Li Hua is said to have learned to fetch the morning paper. The Chinese Li Hua’s short, smooth coat is simple to groom with weekly brushing or combing to remove dead hairs. A bath is rarely necessary. 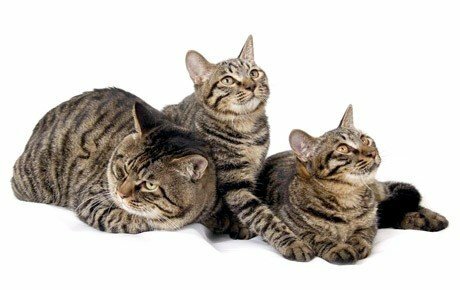 The Chinese Li Hua is large and sturdy with a striking brown mackerel tabby coat that is short and thick. The ticked hairs are black at the root, light yellow in the middle and brown at the tip. It’s sometimes described as a “mouse coat.” The lower belly is a brownish yellow with two vertical and four horizontal leopard spots. Black rings encircle the legs and tail, and the tip of the tail is black. On the face, a small black mark at the upper corner of the mouth gives the Li Hua the appearance of a smile. The head is shaped somewhat like a hexagonal diamond, longer than it is wide and rounded between the ears. Large bright eyes are green, yellow or brown, but green is favored. Medium-size ears have sharply pointed tips and may be tufted. The wide, strong, body, carried on muscular legs, is longer than it is tall. The tail is slightly shorter than the length of the body. Chinese Li Hua mature slowly and may not reach their full size until they are 3 years old. This active but mild-mannered cat is well suited to life with families with children and cat-friendly dogs. He can learn tricks, enjoys interactive toys, and loves the attention he receives from children who treat him politely and with respect. Supervise young children and show them how to pet the cat nicely. Instead of holding or carrying the cat, have them sit on the floor and pet him. Always introduce any pets, even other cats, slowly and in a controlled setting.